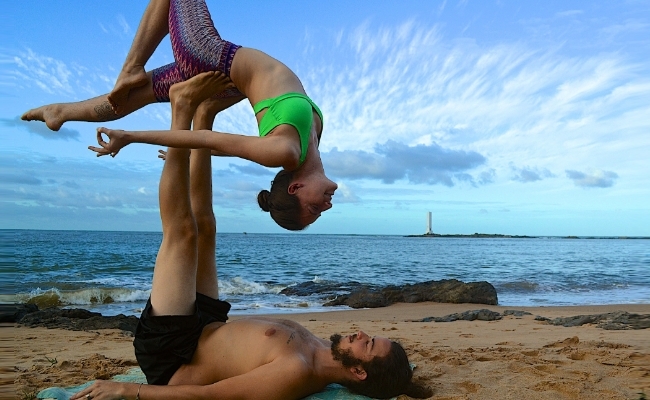 Acro- yoga is a combination of yoga and acrobatics. Acrobatics refers to performing feats of balance. It is usually performed in pairs and is great to maintain a healthy body and a healthy soul. 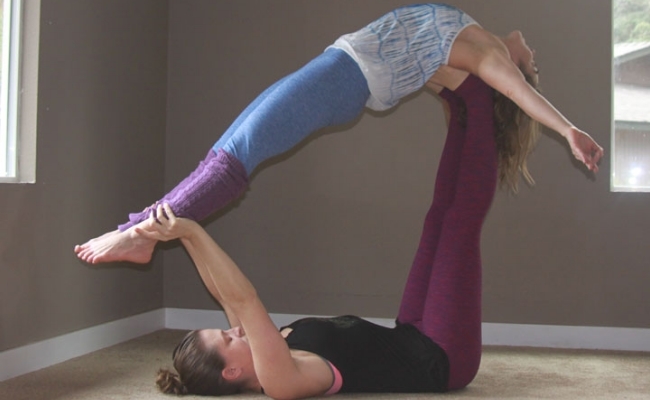 There are three basic poses in acro-yoga which every beginner should be aware of and they are base, flier, and spotter. Base: is the starting position in which the performer is on the ground and must support and hold the flyer. Flyer: one who does the flying with the help of the base is known as a flyer. Spotter: A spotter carefully observes the surroundings to avoid injuries and ensure a correct form of the asana. In this posture the base has to lie on his back with heels over hips, the flier has to stand facing the base and allow ones’ self to lean on the base’s feet. The base with the strong arms will receive the weight of the flyer and lift the flyer off the mat. The spotter has to check that both the base as well as the flyer is able to maintain their balance. Once the flyer is off the mat perform the usual locust pose and stay in that position. Slowly bend your legs and bring the flyer to the mat and come out of the pose. In this posture the base has to stack his knees over the hips keeping the knees hip distance apart. The flyer slowly places his feet on the stacked knees and with the help of the base’s arms finds balance on the base’s shin. Get into the mountain pose first ensuring balance and slowly sit down into chair’s pose. Stay in that position for as long as you are comfortable and release the pose. A spotter is required to monitor their pose. The base has to lift his heels over hips and the flyer stands on the base’s glutes and stretches his arms to reach for the base’s ankle. Base will place his heels in the middle of the flyer’s glutes and bends his knees to receive the weight of the flyer. The flyer connects his shoulder base to the hands of the shoulder and is slowly lifted by the base. As the base lifts the flyer the flyer has to maintain a mini backbend. Hold the position for as long as you can and come out of the pose. The flyer has to stand near the base’s head with his knees touching base’s shoulders. The base has to clasp his heels over the flyer’s shoulders as the flyer leans back by reaching for the base’s ankle and resting his back on his feet. The base has to straighten his legs and give the flyer a deep backbend amd stay in that position for as long as you can and release the pose. This pose requires a good communication between the base and the flyer and must be performed under the observation of a spotter. Start with the flyer in high flying whale position. Let the flyer steadily bend one leg at a time. The flyer then presses the arch of his foot on the base’s knee cap to stabilize the pose. If the flyer feels comfortable in this position by stabilizing his self try the same position by bending both the legs. Perform this asana with both the legs only if you feel comfortable, slowly comeback to the high flying wheel pose and release the pose. This is similar to the usual downward facing dog except that this is performed in pairs. Start the pose with both the base and the flyer in downward facing dog position such that the base’s hands are near the flyer’s feet. The flyer has to slowly walk back to the base’s back and place his feet on the lower back of the base. Stay in this position for about 30 seconds or as long as you feel comfortable and slowly release the pose. The flyer has to make sure that he is maintaining proper balance while placing his feet on the base’s lower back. 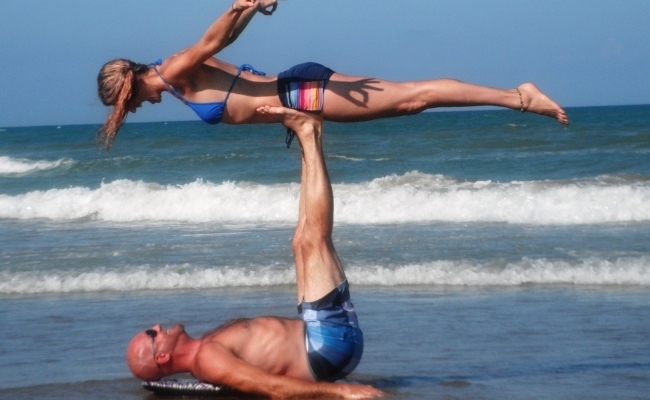 This is simplest form of acro-yoga and can be performed by the beginners. Start the pose by sitting on the ground and facing each other. Fold your knees in front of you and hold each other’s wrist firmly. Now raise your calves so that they become parallel to the floor. Now press on each other’s sole and straighten the legs. Stay in that position for about 30 seconds and release the pose. This is often considered for relaxing the muscles. Sitting on the floor in an easy pose connect to each other’s back. Lift your arms to the side and join your arms so that they form a straight line. Move your joined hands towards the left and twist the torso towards the right. Hold it there for 10 seconds and repeat on the other side.